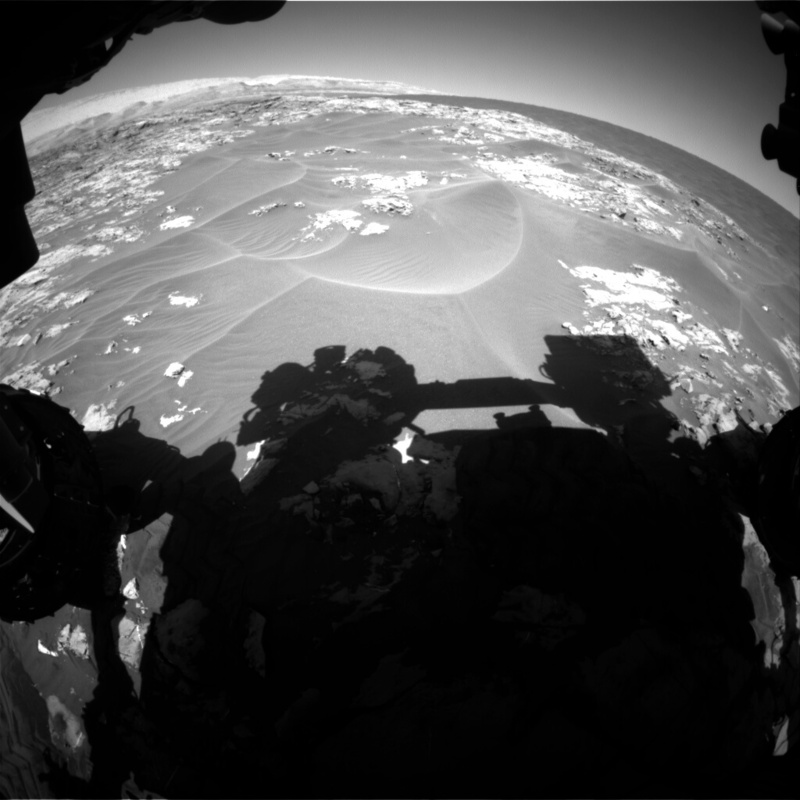 A curious indicator of alien activity on Mars is this photograph beamed back by the rover Curiosity showing what appears to be an unidentified object zipping through the sky. This type of anomaly is not the first of its kind, as other similar sightings have been reported in the last couple years. 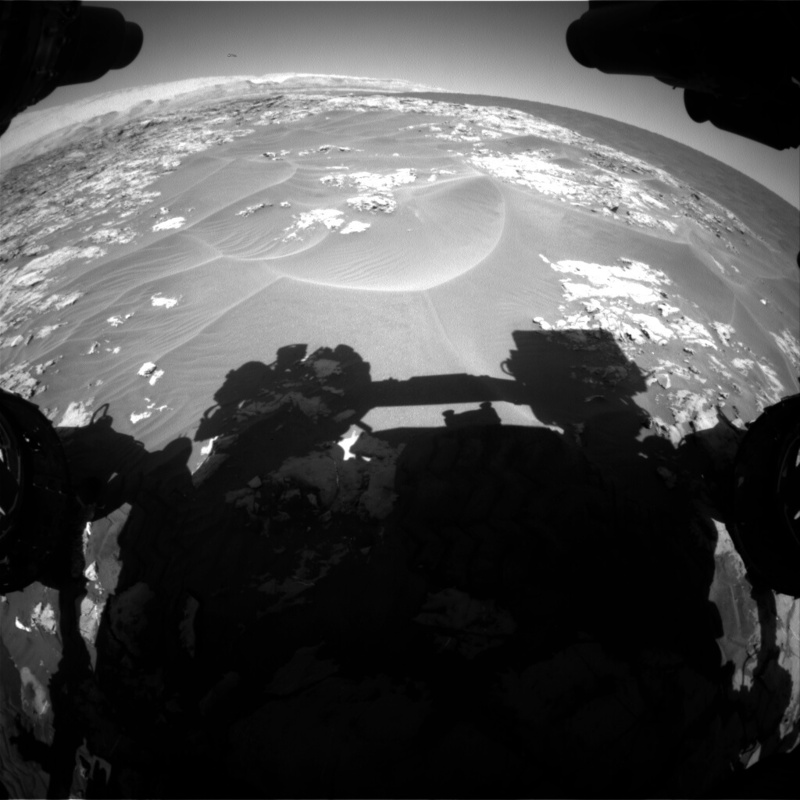 This one however, has a more defined shape, although a bit abstract, but it hints at the fact that the alleged UFO was photographed in close proximity to Curiosity, unlike other similar reports. It appears in one frame from a total of two, indicating that it could be a flying object in motion, and with a considerable speed. 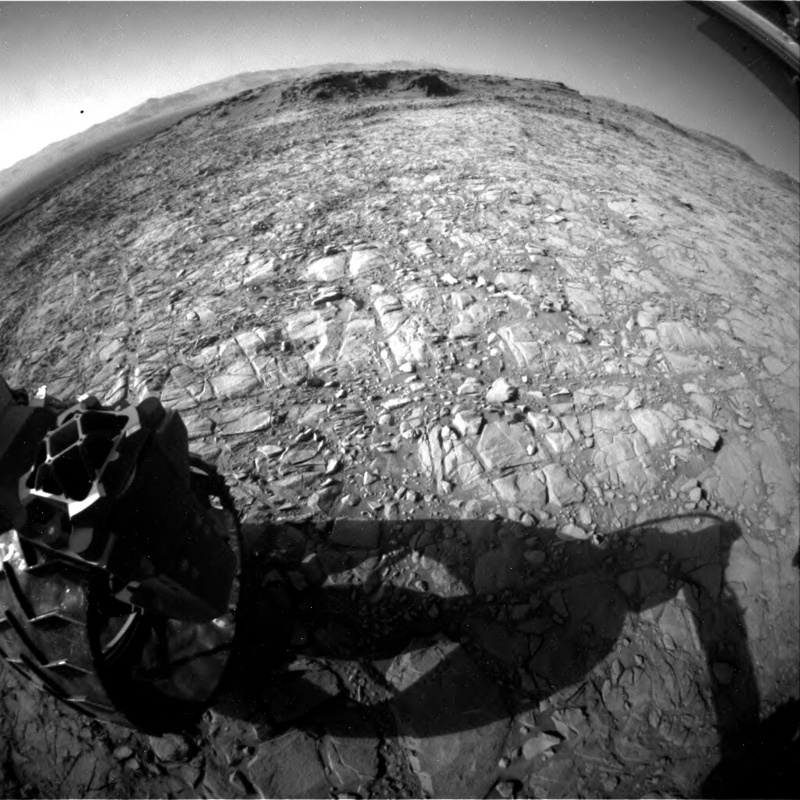 Since it vanishes in the second frame, we can think of the UFO as a spec of dust, lens flare, or camera malfunction, but other similar flying appearances on Mars tend to disprove the above mentioned. A black dot was visible in two other shots captured by Curiosity in November last year, it’s position analog to the one previously presented. Difference here is the UFO is present in two consecutive frames, and in two different spots in relation to the angle where the photo was taken, which remains unchanged. 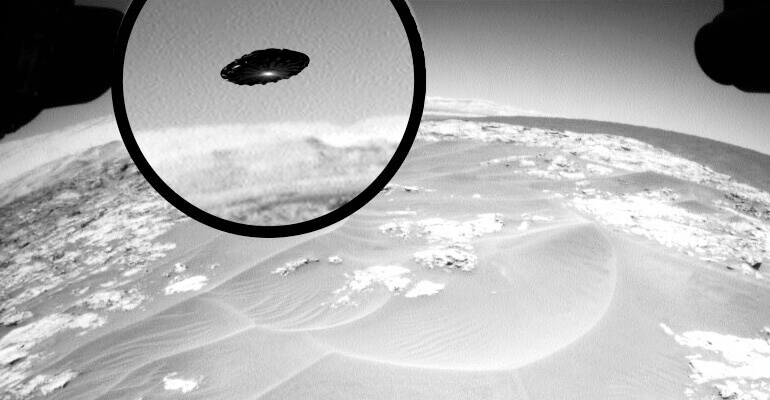 The UFO is perceived as a meaningless dot, but in reality it could be a relevant clue proving that something/ someone is transiting across Mars performing top-secret deeds. See the GIF below of the black dot that persists in both images. The raw images are also available at the bottom of this post. It’s true that simple shapes on the sky can easily be debunked by any interested party, but other unexplained martian sightings are puzzling even for the ‘experts.’ Such is the case of these tiny lights spotted on the surface of Mars on no less than 8 images. The case is even more intriguing since related sightings are also found on our planet. With this in mind, the question arises of whether or not our human species is monitored by an advanced extraterrestrial breed, or maybe by a shadow government with advanced toys in stock. What is certain is that such appearances were present whenever the human species had reached an important milestone, making a reference here to the Moon landing with all those UFOs. 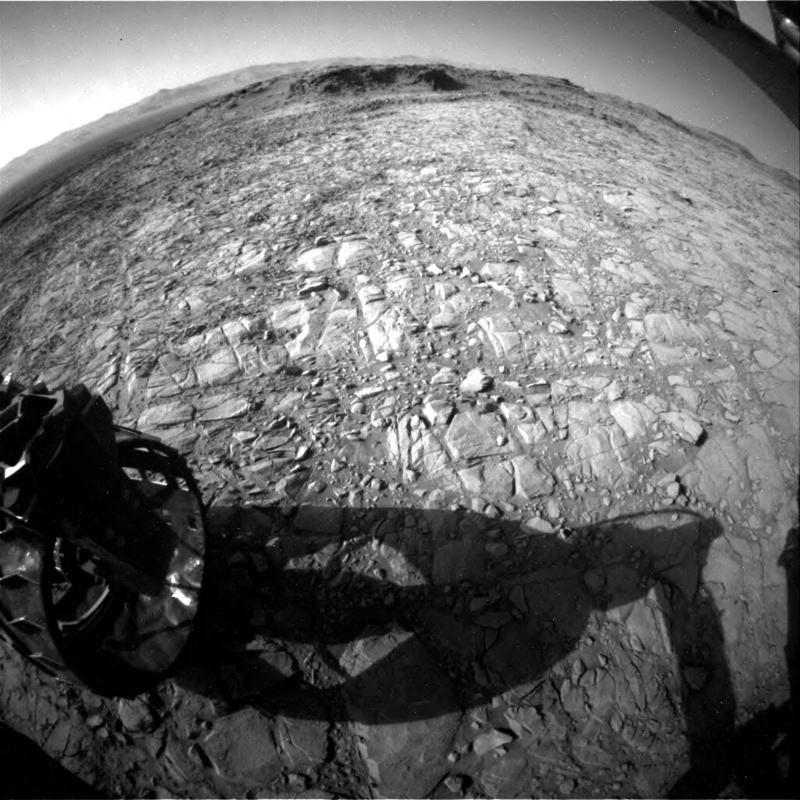 In the case of Mars, the bright orbs, together with the peculiar shapes resembling flying objects, all appearing to be spying on the rover from a distance, and sometimes even prefer to pose in front of it to make an impression on us earthlings. After all, we are intruding on their territory, and not vice-versa. Could this plethora of otherworldly anomalies be but mere coincidences? Or rather the product of an intelligent design, be it extraterrestrial or related to the military and other space black-budget programs?